When making this recipe, be sure to prepare extra bacon croutons, because, well, does a better leftover exist? In a large, heavy saucepan, heat olive oil. Add sweet potatoes, onion, crushed red pepper, and 1½ teaspoons salt, and sauté over medium heat, stirring often, until onion softens, 4 to 5 minutes. Add tomatoes, water or stock, and sage or thyme. Cover and simmer until sweet potatoes are completely tender, about 20 minutes. While sweet potatoes cook, heat bacon grease in a large skillet over medium heat. Toss bread cubes in a bowl with smashed garlic clove. Remove garlic and discard. Sauté bread cubes until golden brown on all sides. Sprinkle with salt and pepper. Remove sage from sweet potatoes and discard. Puree soup in saucepan with an immersion blender and season with salt and pepper to taste. If you prefer a very smooth soup, you can strain the mixture through a fine-mesh sieve. 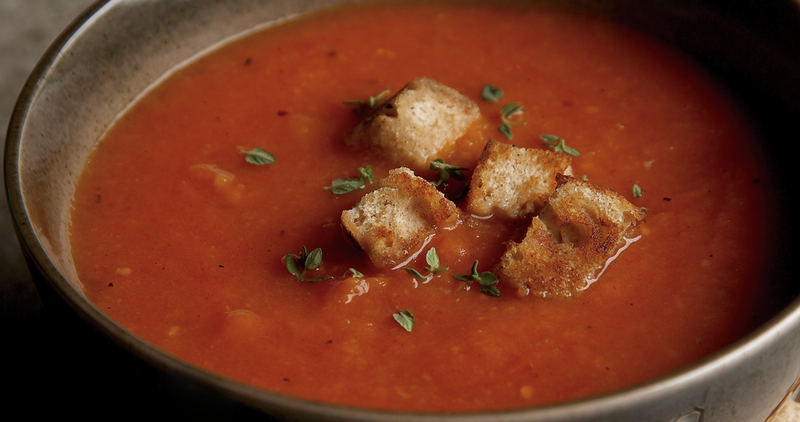 Garnish each bowl of soup with a scattering of croutons and a drizzle of cream or crème fraîche, if desired.